I saw an article on the Glendale news website called “The Clean Air of Facts“. It is so poorly researched and reads like such thin propaganda that I had to reprint it here with a breakdown of how Glendale is trying to pull the rug over our eyes when it comes to Grayson. Here’s the original article as a pdf if you want to read it on its own or if they decide to change it. In my research for this I found that Glendale has put this list of their fictions up in one form or another in several places like here, here, and here. The link to the article was sent to me by Eliza Papazian, the PR person for Glendale out of City Manager Ochoa’s office, in response to my submitting comments to the Grayson Expansion draft Environmental Impact Report (DEIR). I’ll put the original article in Red and intersperse my comments in Black. I’ll put quotes from their documents in Blue. Recent conversation about the Grayson Repowering Project has resulted in the publication of misinformation by individuals and groups. Rumors regarding Health and Environmental risks have sprouted, causing the spread of inaccurate and incomplete information. In other words, people are actually reading our 5000 page draft EIR and finding all the stuff we are legally required to write but tried to hide in appendixes, awkwardly worded statements, and obfuscated facts. The best policy is to rely on facts. That’s why we’re putting up this clarification for you. It’s with this simple idea that we bring the residents of Glendale the following information about the Grayson Repowering Project. This article is looong. Who is the city paying to write all this? I thought they were on a tight budget. FICTION: The City is proposing the expansion of the Grayson Power Plant. FACT: Glendale Water & Power (GWP) is not proposing to expand the Grayson Power Plant. The final plant will be 33% larger in megawatt capacity than the current configuration. This is in the IRP and EIR (see below). They actually can’t call it an expansion because then they would get in trouble with the Air Resources Board who approves rebuilding power plants with grandfathered pollution permits. The driving force for replacing the obsolete Units 1-5 and 8* at the Grayson Power Plant is to ensure a reliable electric supply for the citizens ans [sic] residents of the City of Glendale. A majority of the facilities located at the Grayson Power Plant were completed between 1941 and 1977. The actual capacities of the units. As you can see the capacity of units 1-5 and 8 are currently capable of producing up to 185 MW. The Draft EIR states that the new units are designed with a capacity of 262 MW. This is a 33% increase in total plant capacity. We are proposing to rebuild substantial portions of the plant by taking old generating units out of commission, dismantling them, and building new, modern units in their place. The new repowered units will be cleaner, more energy efficient, and increase reliability of Glendale’s power grid. The new units really are cleaner per megawatt-hour of power produced, but GWP wants to produce a lot more megawatt-hours of power (more on that later). There is no denying that the old power units are old. What has not been provided in the DEIR are the costs to maintain these old units. They are proposing a new plant that will cost $16 million per year over 30 years. All of the repairs and upgrades on these old units has not been $16 million per year. Their only analysis of keeping the old plant was to just let it fail. Like if you had an old car and you just stopped changing its oil and transmission fluids because once it dies you could buy that new Maserati you’ve had your eye on. Anyway, they repeat themselves a lot so we’ll discuss this later. FICTION: The cost of repowering the Grayson Power Plant is excessive. FACT: GWP is proposing to finance the repowering project through the issuance of bonds. GWP regularly sells bonds to finance capital projects, and the payments for the GWP bonds are covered by the revenue that GWP receives from its customers based on its rate schedule. The tax revenues that the City receives are not used to pay off GWP bonds. We found the $500 million figure on the old FAQ on the official Grayson Repowering website. But, guess what – recently they removed it and replaced it with lots of text from this list of Fictions and it doesn’t include a cost estimate. They are trying to hide the fact that it is estimated to cost $500 million dollars! The $500 million bill they want to hide. Someone pointed out to me that those bonds at 30 years at 4% interest will cost Glendale a total of $850 million! Right now much of the natural gas burned at Grayson is biogas that is free from the Scholl Canyon landfill. The new turbines can’t burn biogas so they will be burning more natural gas in the new units to produce the same amount of energy. The biogas will be burnt in a new separate power plant at Scholl Canyon Landfill (more on that later). and for short-term energy needs, the new units can deliver energy more cheaply than spot market power purchases that must be imported with their associated transmission costs. Additionally, the new units will be able to provide spinning reserve (on-line generation that can respond to losses in supply) more cheaply than purchasing and importing spinning reserve capacity from other sources. From their Integrated Resource Plan (IRP) which came in 2015 before the new renewable mandate of 50% by 2030, by the way. “The 250D portfolio achieves the lowest cost [per MW] as a result of significant market sales opportunities that develop with 140 MW of efficient combined cycle capacity.” The 250D project is the one they selected. It’s the largest and dirtiest one of the four they looked at and they claim it won’t impact the ratepayers because they plan to run it at full capacity to sell the power to other cities around California. So, yes the new units are cleaner per hour of energy produced but they have plans to generate many, many, many more hours of energy to sell. But what about that renewable mandate? At a time when other utilities are going to be trying to have less dirty energy in their portfolios, GWP will be trying to recoup $500 million selling them dirty energy. Then if SB-100 passes next session the demand for dirty energy is going to go to zero and we may have a stranded asset in order to go to 100% renewable by 2045. Remember that these bonds will have to be repaid with interest by the City of Glendale whether the plant makes money or not. If it is destroyed in the big one (see below) or is stranded, we still have to pay the debt. Watch the video here to see how GWP was very excited about the idea of selling power in 2015 when they finalized the IRP and were starting on the DEIR. Their consultant directly states that GWP really only needs 200 MWs and that the rest could be sold to help pay for the plant. The IRP recommends they find a long term buyer. Suddenly, in 2017 they are saying they don’t want to sell power but sales was the basis for choosing the largest plant in the IRP and the DEIR! GWP is currently undertaking a cost-of-service analysis that will consider all GWP activities necessary to reliably deliver electricity within Glendale that are funded by rates, including capital projects such as the Grayson Repower. The development of a rate case is currently underway and estimated to be completed in February 2018. This rate case is not a result of the proposed project, rather an analysis of electric rates and the cost of providing and delivering reliable power to customer’s homes. Keep in mind that a portion of our rates and GWP’s profits are given to the City treasury to prop up the city’s budget. By generating more electricity and selling it to other cities, the city will get a boost in their budget. More pollution from Grayson for more revenue – that sounds like an awful way to balance a budget. FICTION: The Grayson Power Plant does not need repowering. FACT: The current units at the Grayson Power Plant are well beyond their useful life. Unit 3 is currently out of service. The remaining units (1, 2, 4, 5, and 8) are all 40 to 70 years old and are not expected to continue running much longer and maintenance on these units is temporary and very costly. Once again they don’t provide numbers for this. How much will it cost to maintain these old boilers? Will it cost $16 million per year – that’s the prorated cost of the new plant. If they can hobble along for 10 years that will make a huge difference in renewable alternatives. Plus if SB-100 passes next year we’ll at least know that the lifespan of a new plant is even shorter than expected. The problem is that since Mr. Zurn took over they’ve skimped on maintenance. They did re-tube unit 4 not long ago at a cost of $4.5 million, so that unit is in pretty good shape. They could do the same with the others. The idea that they need to do something urgent begs the question of why they waited from the middle of 2015 when they prepared the repowering plan to the middle of 2017 when they came out with the Draft EIR. Where was the sense of urgency then? Approximately 100 MW (some owned, some purchased) that comes from the southwest (Arizona, Nevada, Utah, and elsewhere) to southern California over three different transmission lines, and then through the LADWP system for delivery to the GWP system. These four sources total 287 MW if everything is running (leaving no reserves to cover the loss of one of these sources). GWP’s peak load is 350 MW and occurs during the summer or during a heat wave. This is when surrounding utilities also experience their peak loads. GWP would make every effort to purchase additional power to cover shortfalls. However, GWP’s options are limited. GWP’s ties to other electic systems for large power imports are limited to LADWP and what can only be brought through LADWP. If additional sources could not be contracted, then demand would exceed supply and the City would experience rolling blackouts. During construction they plan to take out the old units immediately and go three full years with only unit 9 at Grayson. Their plan is to buy power on an interim basis from LADWP, but only 25 MW in the winter and 75 MW in the summer. If 75 MW is enough to cover peak summer needs for three years, why do they suddenly need 262 MW from the new expanded units? In the past, LADWP has on an emergy basis provided spot supplies of power to tide GWP over. However, that was at a time when GWP has the Grayson Units operating and supplying some amount of power. With no Grayson Units except for Unit 9 available to operate, the request that GWP would make of LADWP could be more than they could supply. Thus, GWP and the residents of Glendale would be left in a precarious position. Glendale is part of the Los Angeles Balancing Area and we have a contract for power in emergency situations. We pay for the rights to emergency power like insurance with a marginal cost if used or not. We pay extra for that energy if we need it and they would pay significant penalties if they didn’t have the power when requested. We currently only contract for 40MW of emergency power but we can adjust that amount given notice. The cost for a 100MW reserve would be $3 to $4 million per year – again far below the $16 million per year cost of a new power plant. **A Megawatt (MW) equals 1,000 kilowatts of power This is a fact. We will have to purchase the power from another source outside our control, which will be more expensive and unreliable. GWP has been unable to obtain long term contracts for capacity in excess of 200 MW. The alternative is to purchase the power from another source and factor that into the rate structure. It will be more cost effective to the rate payers to finance the repowering project than to purchase the power from another source. 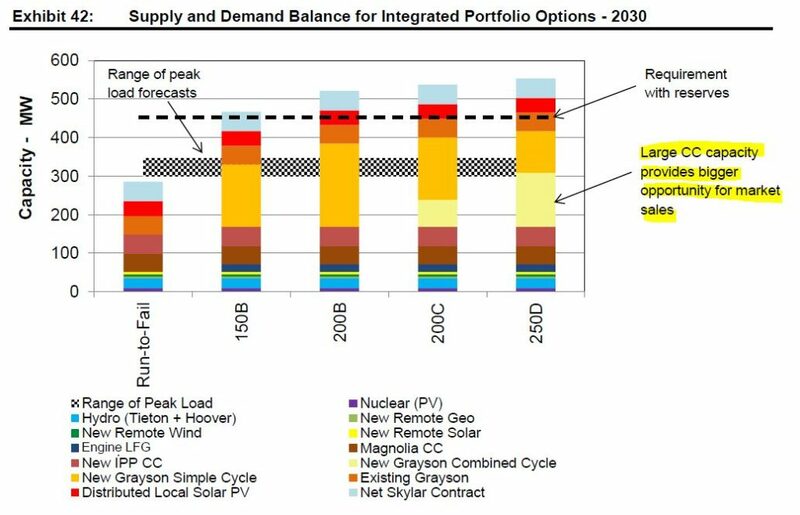 Look at what GWP itself said in their 2015 IRP: “Given current supply and peak load expectations, GWP currently maintains a sufficient capacity margin to support reliability and reserve requirements.” At that time, GWP enjoyed a supply capacity of 423 MW (233 MW from existing Grayson, plus 190 MW of imported power). To our knowledge, there have been no reductions in supply since then other than the termination of San Juan coal (~20 MW). Therefore, current supply should be slightly over 400 MW. If current peak demand is 350 MW, as GWP states, then we can establish that a buffer of 15% over peak load is sufficient in their estimation to support reliability and reserve requirements. Their words, not ours. But the proposed expansion would leave GWP with a net supply of about 490 MW (310 MW from the new units plus the existing unit 9, 12 MW from the Scholl Canyon biogas generation project, and the remaining 170 MW of imported capacity). This would represent a supply-demand buffer of roughly 40%. They have not refuted this because they can’t – these are all their numbers. Finally, they go for another red herring. No one is saying do nothing. What we’re saying is do something more sensible, such as invest in technologies of the future not those of the past. FICTION: GWP is repowering Grayson to generate excess power in order to sell it for profit. FACT: We are proposing to repower the plant to meet the City’s load demand and to ensure that there is a reliable source of power for Glendale. GWP is not repowering to sell energy for a profit. The capacity of the Grayson repower was driven solely by the reliability needs of Glendale and minimizing rate impacts to GWP customers. GWP is a publicly owned utility and our mission is to provide clean and reliable power to our residents and businesses. Why did they explicitly recommend finding a long term buyer? Why did their own consultant say they don’t need as much as they are building but that’s OK because they can sell the rest? The idea of sales isn’t something we came up with – we got it from GWP’s own documents and statements. They do make a point of slipping that “for profit” phrase in there whenever they mention sales. Then they emphasize that they are doing it to minimize rate impacts to GWP customers and that they are a public utility. Right, so they aren’t an investor owned utility so they aren’t selling “for a profit” but they are definitely planning on selling power to other cities. They are planning to increase pollution plain and simple. FICTION: Glendale doesn’t need this much power and doesn’t need to build such a large plant. FACT: The capacity of the Grayson Repowering Project is driven to reliably serve the needs of the residents and businesses of Glendale. 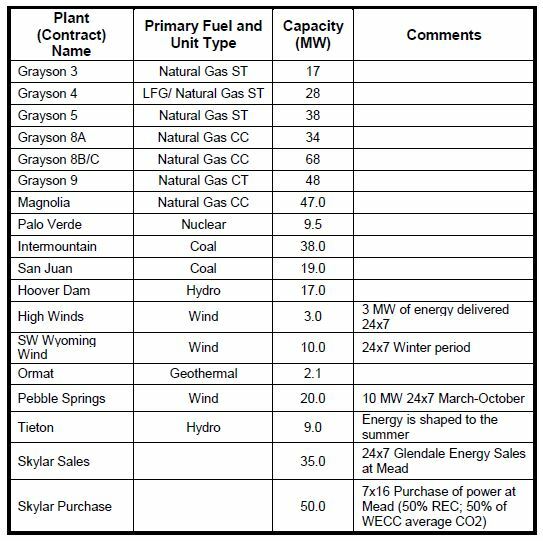 Without the Grayson Repowering and after Units 1 – 8 are no longer capable of running, the available capacity through imports from outside sources and and the one newer unit at Grayson Power Plant – Unit 9 – is 287 MW. GWP must have in place sufficient reserve sources of power to cover the “loss of the single largest contingency.” This means that we must maintain enough generating capacity to power the City even if there is an unexpected failure or loss of our largest single source of power. For GWP, the single largest source of power is the DC Intertie line, which transmits 100 MW of power to the City. See image of GWP’s sources of power here. In fact, partial and complete loss of the DC Intertie line has occurred in the past, and some of the outages have been for extended periods of time. In addition, reserves must also be in place to reestablish reserves within one hour. With the loss of GWP’s single largest contingency, the City would have only 187 MW of supply available for meeting its obligations. Their own consultants said they don’t need this much power (it’s on tape). End of story. Also, see above where they plan to have an oversupply of 40% over max peak load. Also, if they increase their insurance with the balancing authority as outlined above they will have their single largest contingency covered. GWP’s system load exceeds 187 MW more than 80 days a year. [DEIR page 347 – 81 days. Why do they say “more than 80”? – just to make it scary I guess] With respect to a peak day, GWP’s peak load is 350 MW (with no allowance for reserve margin) and there would be a shortfall of 163 MW that would have to be supplied by resources internal to the City. This is precisely why they should keep the other units running long enough to build up solar generating in Glendale (their own consultants said they didn’t study how much solar could be produced on sites the city has control over, let alone what could be produced on residential and commercial rooftops with the right incentives) and to invest in battery storage. And why they should look into techniques, such as time of use (TOU) pricing to drive down peak demand. If they did all that, they could reduce peak demand by 100 to 200MW and meet demand without building a new plant. The Grayson Power Plant, once repowered, would add a capacity of 262 MW at average annual conditions (64° F). On a hot day (95° F), that capacity would fall to 242 MW. On the peak load day (100°+ F), the available capacity would be slightly less. With 242 MW available at Grayson Power Plant, the City would have approximately 80 MW as reserve capacity. Thus, the Grayson Repower allows GWP to reliably serve Glendale by providing sufficient capacity to cover the loss of the single largest contingency and still meet load, as well as the non-operating reserve that could be started to provide the required spinning reserve. Again, we don’t need to build our own plant to cover this contingency. That is exactly why we are members of the Balancing Area. We can cover the contingency with insurance through the Balancing Area for cheaper than building a new plant. Additionally, as GWP imports increasing amounts of windd [sic], solar and other variable sources of renewable energy in the City, and as more solar power is generated locally in Glendale, this creates increased fluctuations on the power grid. A steady, constant source of energy such as that from the Grayson Power Plant is needed to balance out (“firm and shape”) the energy so that a smooth and steady supply of power can be delivered to GWP customers. The old Units at Grayson Power Plant do not have the ability to reapidly adjust up and down to account for variances in solar output, based upon weather patterns on a minute-per-minute basis. Modernizing Grayson will allow GWP to manage renewable energy flows dynamically, so that energy deliveries will continue to be reliable. Solar + battery storage + energy efficiency + demand management can solve the problem. But how would they know when they haven’t studied this? Again this could be handled by a small local plant and services from the Balancing Authority. Also, while it is difficult to get copies of the existing power purchase agreements to verify, a recent agreement included firming services. This is the no-bid 21-year $650 million deal with Skylar Energy – a company which coincidentally enough has an ex-GWP energy trader as a Vice President who got the job shortly after the original deal with Skylar was signed. Steve Zurn says that Varuj “Rich” Ghazarian “did the math” for GWP on the deal shortly before going to Skylar. Nothing suspicious there. FICTION: GWP isn’t going to install any renewable energy sources at Grayson. FACT: GWP will be placing solar panels onto the new buildings at the Grayson Power Plant, totaling approximately a ½ MW. 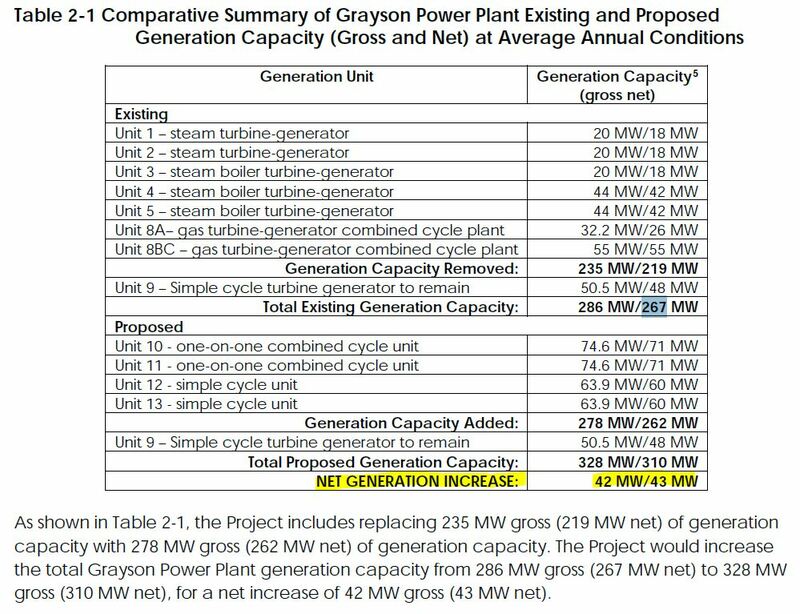 GWP also plans to install 40 MW/80 Megawatt-hours (MWh)*** of short term battery energy storage for regulation purposes at Grayson to reduce short-term cycling of units. This will be done after the power plant is repowered. This is not in the IRP or the DEIR. Why isn’t it? It would have been great to include it in the profile and reduce your emissions/MW produced. We’ve been unable to find these plans anywhere. Could you publish them? GWP is committed to renewable energy and will continue to expand our programs to use more solar and wind power. GWP is a leader within California in supplying carbon-free electricity. In 2016 GWP sourced 64% of the energy it supplied to Glendale from carbon-free sources (compared to 44% for all of California). Glendale is already close to meeting the requirement for 2030 that publicly-owned utilities procure 50% of their electricity from eligible renewable energy resources. Today, far ahead of the 2030 target date, Glendale procures 47% of its electricity from eligible renewable energy resources. This number will only continue to grow. This is great. GWP is slightly above the legal minimum. So by 2030 we can only get 50% of our power from dirty energy. So take all the capacity arguments you have above and rerun the numbers. Grayson will only be able to fill 50% of our energy needs maximum by 2030. In 2030, 9 years after the new Grayson comes online, we will have a 310 MW dirty energy plant, 39 MW dirty energy from Burbank, and another 200 MW worth of renewable and non-renewable power contracts coming over transmission lines. We’ll have a peak load of 365MW unless you address peak loads which you haven’t seriously discussed. Let’s say 100% of that remote power is renewable (it isn’t – it’s more like 100MW) – That means we’ll have 349 MW of local dirty power to handle the remaining 165MW of need. That’s at peak load which is a handful of days in the summer. Therefore, it looks like we’ll be occasionally running Grayson about 3 months out of the year by 2030. It is insane to build such a large dirty plant at this time – unless you are planning on selling the extra power (but remember they will be trying to buy renewable power not dirty power). If SB-100 is passed next year as many analysts expect then GWP will need to get to 100% renewable by 2045. This is a $500 million boondoggle. The council signed onto the Paris Climate Accord this year to keep a global temperature rise this century well below 2 degrees Celsius above pre-industrial levels and to pursue efforts to limit the temperature increase even further to 1.5 degrees Celsius. 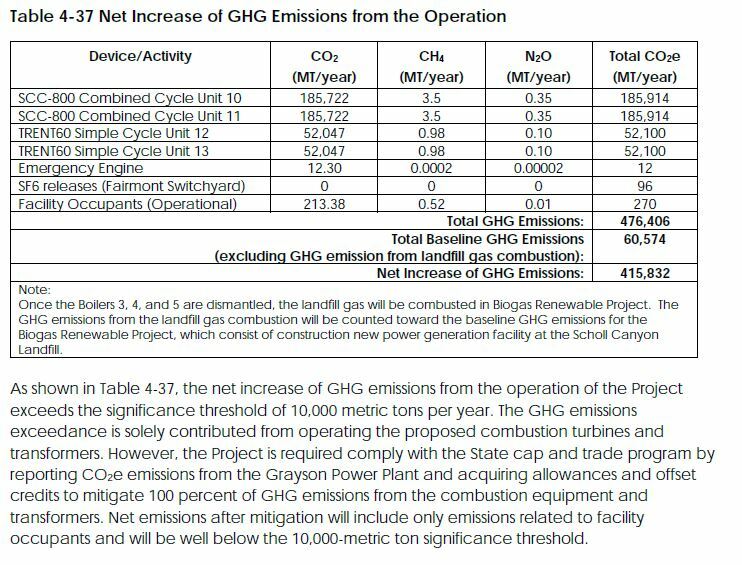 The proposed Grayson expansion will have a net increase in GHG Emissions of 415,832 metric tons/year according to the DEIR. I don’t see how increasing our city’s emissions by 415 thousand tons per year can be considered in line with the Paris Climate Accord. GWP also provides incentives to Glendale homeowners to install solar power and has in place contracts for electricity from renewable sources. Currently, there are approximately 1,344 solar systems installed in the City, totaling 12.2 MW. This capacity is “behind the meter,” with only a portion being delivered into the GWP electric system. GWP encourages rooftop solar, and solar installations have helped to reduce the load growth within GWP. However, because the State does not allow it to be counted towards GWP’s efforts to meet renewable energy mandates, this solar generation does not appear in Glendale’s power resource mix. Yes, you have an incentive program for Glendale homeowners. SB1, the Million Solar Roofs Initiative, requires you to do so with state funding. The program is so popular that it runs out of funds within hours of accepting applications each year. You now have a lottery to see who gets funds. Not knowing if you get an incentive makes it very difficult to plan a system and having a lottery means uncertainty which means people may put off their system until they win the lottery. Last year the state put $959,000 into the incentive program. This funded 123 of the 188 applicants. Zero low income applicants were funded. There is an obvious need for more rebate funding. GWP should be adding to the funding to fund 100% of the installations and actively recruit low income and medical services customers. In 2015, only 758 kW capacity was installed. $250 million, half the proposed cost of Grayson, funding 50% of rooftop solar costs would reduce peak demand by 200MW and eliminate the need to repower Grayson entirely. Plus, it would take advantage of the 30% federal tax incentives to pay for our power supply and we could sell the green energy credits for the power generated. We could make Grayson a museum to how cities used to poison their air to make electricity – like Seattle’s Gas Works Park. I encourage you to put solar with battery backup on low income houses, homes with electrical medical equipment, and medical centers first. Of course, you don’t really want to have that much solar in your service area because you make money when you sell electricity to customers, not when you reduce demand. It has been pointed out that Glendale is still not in compliance of California’s Solar Rights Act. Glendale continues to use zoning as a tool to prevent solar installations. Residents should not have to engage the State Attorney General to get solar projects through the planning process. ***A megawatt hour (MWh) equals 1,000 kilowatts of electricity use for one hour. Agreed. FICTION: Repowered Grayson Power Plant will use potable water. FACT: The Grayson Power Plant would use recycled water for all process and cooling water requirements. The main use for recycled water includes boiler water makeup, cooling tower makeup, turbine power enhancement and cleaning, and NOx control for the simple cycle units. Recycled water would also be used for Unit 9 in place of potable water currently being used. The use of recycled water would eliminate the need for 20 acre-feet of ground water from wells in Glendale and 41 acre-feet of potable water currently being used, which is also water efficient and helps improve the City’s overall water conservation efforts. This is true, I don’t remember hearing anyone contest this. But as long as you brought it up, why wasn’t changing old Grayson to use recycled water part of the No Plan option? Or would you have to have had a No Plan Plus Recycled Water option? By the way, is the recycled water that will come from the giant underground storage tank across Verdugo wash been tested for chromium-6? Grayson and the surrounding areas is a superfund site for underground chromium contamination. If it is leaking into the recycled water tank and that contaminated recycled water is used in the cooling tower then that means chromium-6 in the air. FICTION: California’s cap and trade program requires all power producers to pay a cost per ton of CO2 emitted. The cost is being underestimated. FACT: The cost of greenhouse gas credits would be incurred by Glendale whenever it uses electricity from fossil fuel resources, whether GWP generates it or it is imported over the transmission system.Fossil fuel resources will be required until systems of energy storage have been proven on a utility scale for a utility such as GWP. The operating costs would therefore be incurred either way. Intermittent renewable purchase contracts also include a portion of fossil fuel generation. If they replaced Grayson with the big four – solar + battery storage + energy efficiency + demand management – they don’t need to pay the credits. They’ve estimated the credits will cost $30 per ton in 2030. Economists forecast a low end of $90 per ton. That’s a difference of $25 million in 2030 alone based on a net emissions increase of 415,000 tons of CO2e. FICTION: The Grayson Power Plant sits on a mapped Liquefaction Hazard Zone which makes it susceptible to ground movement in the event of an earthquake. 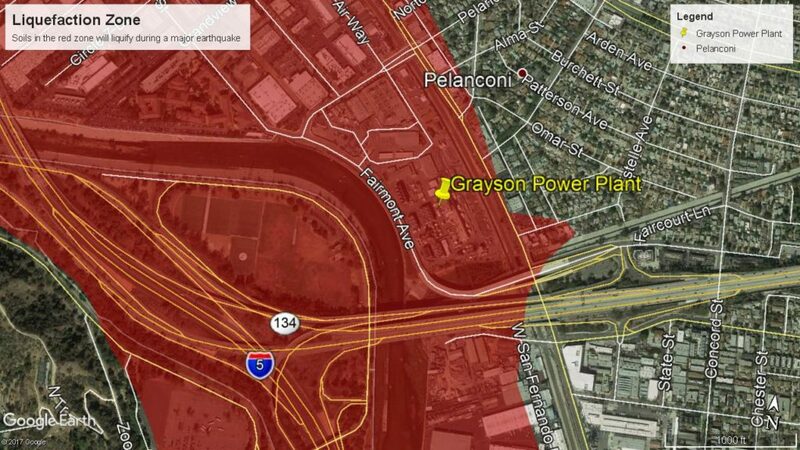 FACT: Like much of the Glendale are, the Grayson Power Plant site is located within a liquefaction hazard zone. A site-specific geotechnical study for the repowering project was performed and included analysis of seismic and liquefaction risks. The geotechnical study included recommendations for project design in conformance with applicable building codes, which include considerations for seismic and site-specific liquefaction hazards. Wait, you just agreed that the Grayson Power Plant sits on a mapped Liquefaction Hazard Zone and that it is susceptible to ground movement in the event of an earthquake. You’re just arguing with yourself now. Grayson sits on an Earthquake liquefaction zone. The site has been the home of the City’s local generation for over 75 years and has been subjected to several major earthquakes, including the Sylmar and Northridge earthquakes. Notably, GWP has been able to restore electricity to its customers faster than any other nearby city or Southern California Edison, in part due to having local units at Grayson that were either already operating or were started up, due to seismically-induced loss transmission imports. The LA River area is particular vulnerable to liquefaction. Sylmar was a 6.6 magnitude earthquake. Experts say we need to be prepared for an 8.2 magnitude on the San Andreas fault. An 8.2 quake would be 250 times stronger than Sylmar. It is highly likely that in the event of a magnitude 7.0 or larger quake, ground movement would be enough to sever gas pipes, leading at worst to gas leaks, explosions, and fires, and at best to incapacitating the major source of power Glendale hopes to rely on in just such a situation. This type of risk is best mitigated with a distributed solution based on a combination of solar, battery storage and micro-grid infrastructure and not one built around a single point of failure. FICTION: GWP didn’t consider solar panels and batteries to power Glendale. FACT: Utilizing solar power alone, whether generated locally or imported, would require a significant storage system to be built to “time shift” enough energy to cover approximately 65% of the hours that the sun is shining (the 65% value considers the variability of solar energy while the sun is shining). Such a system would be larger than any projects currently being contemplated or constructed to date, and is estimated to cost significantly more than the proposed project. AS with all energy projects, battery storage projects also have ongoing costs, in the case the periodic replacement of the batteries and the efficient recycling of batteries. That’s why you shouldn’t look at solar power alone as a solution. It’s called a “straw man” argument when you inaccurately reframe an argument so that you can easily take it down. If solar power imported over transmission lines (along with other carbon-free imports over those same transmission lines) was relied upon as the source of power, most of it would be consumed during the daytime, leaving little, if any, for charging the batteries. During the evening, when the transmission capacity exceeds the GWP load, solar power is not available. Thus, the batteries would be charged using non-solar carbon-free resources, and if they were not sufficient, then other fossil fuels resources. This is why solar has to be combined with a battery system. During the day our needs could be met with transmission line power, 200 MW rooftop solar, battery, and local generation. At night, transmission power and local generation would power and refill the batteries. Local generation means Magnolia and Unit 9. If Glendale would study these options we could find one that fits. For a utility scale solar power plant located within Glendale, a large site would be needed to generate sufficient energy to serve daytime load and charge the batteries. For each megawatt of solar generation installed, approximately 4 to 6 acres are required. To provide the 262 MW that would be required to replace the units that would be lost at the Grayson Power Plant would require approximately 1,310 acres, or approximately 2 square miles. Such a large space is not available in Glendale. No one seriously thinks that utility-scale solar would fit in Glendale. This is some idea GWP’s consultants came up with so that they could turn down solar (see straw man argument above). But actually, this shows your mindset – you’d look at utility-scale solar where you could produce the energy and sell it to customers at a profit before you would consider large scale rooftop solar which reduces the need for power plants and reduces your profit. 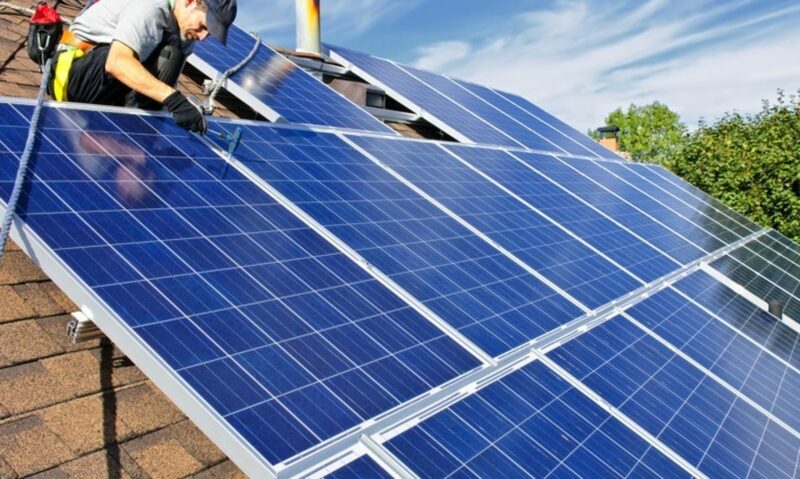 Rooftop solar is another potential source of solar energy, and GWP provides incentives to Glendale homeowners to install solar power on their roofs. Currently, there are approximately 1,344 solar systems installed in the City, totaling 12.2 MW. Those systems are estimated to generation approximately 16.5 MWh of energy. See above – your incentive system is chronically underfunded and restricts installations. However, the City cannot count on solar generation on private residential and commercial properties as it does not have control over these systems. Why can’t you count on solar generation on private property? You enter power purchase agreements with private companies all the time. Why would it be different for small systems? If that doesn’t work for you then put out a request for offer for 200MW worth of rooftop solar to be installed and let the private sector deal with the leases, sales, and contracts with the owners. I bet SolarCity would step up to the plate. Solar energy sources do not necessarily need to be located within the City’s limits. By freeing up transmission which would occur as a result of the Grayson Repowering Project, it would allow the City to either purchase or own solar outside the City’s limits and transmit the energy into the City’s electrical grid via existing transmission lines. So, instead of building local solar you want to build a local oversized dirty power plant so that you can import solar power from somewhere that has the foresight to build local solar? It’s like the public is from Mars and the utility is from Venus or something. Do you understand how this sounds to us? You want us to breath dirtier air so that we can import energy from somewhere that is producing it cleanly? Wth? We have Unit 9, Magnolia, and LA Balancing Authority, plus an old plant that still works. LA just built a new line to Lancaster (which is going gangbusters with renewable energy btw) but we didn’t get a part of that transmission line. In the IRP it says “For the build and own option, Pace Global relied on a report produced by Stantec on the costs of interconnection between the SCE substation at Eagle Rock and GWP’s Kellogg substation. The total capital costs of the new transmission [100MW] interconnection were estimated at $66 million, amounting to an annual cost in the “150 Series” of $3.4 million when amortized over a long-term period at GWP’s cost of debt.” Then it goes on to say that renting would be cheaper but it doesn’t mention that renting or buying more transmission isn’t available. the necessity to be capable of dealing with the loss of a transmission line, and the need to add capacity as needed due to the intermittency of renewable energy (to balance out and manage the fluctuating power flows), all while still ensuring a reliable supply of electricity. This is where our agreement with the balancing authority needs to be properly sized to our needs. We should cover our single biggest contingency with an agreement with the balancing authority as it is cheaper than building a plant that will sit idle. GWP considered all solar and all battery but didn’t fully study holistic combinations of the two in conjunction with energy efficiency and demand management. The Utility Commissioners saw this clearly and called them out on it. GWP’s thinking lacks creativity which is why we are calling for an independent study by experts in clean energy. Pace who did the IRP is owned by Siemens – the makers of the gas turbines they recommend and the DEIR was done by Stantec who did the EIR for Keystone Pipeline. The DEIR shows the resumes of the engineers that worked on it and none of the main engineers had renewable power experience. We need renewable power experts to work with GWP on finding the best mix of power for our future. FICTION: Scholl Canyon can be used as a solar site. FACT: GWP partnered with a private developer two years ago to study the possibility of developing a solar project at Scholl Canyon. The developer determined that the site constraints at Scholl Canyon made it unsuitable for solar development. For example, the existing environmental control systems for the landfill are required even for a closed landfill (these systems gather methane gas that would otherwise escape to the environment, a gas that has a global warming potential 21 times greater than CO2). Those systems require continued access, which consequently limits the land available for solar panels. In addition, the landfill is subject to significant settlement, which would take the solar panels out of alignment, as well as complicating the electrical gathering system design, necessitating regular rebuilding and realignment. These answers further illustrate the type of rigid thinking typical of GWP. No one is arguing for one location to meet all needs. Very significant amounts of solar power can be generated using a combination of open spaces plus city owned and private rooftops. That, coupled with storage, demand management and efficiency can meet most or all of Glendale’s needs. Note that the private developer was Skylar Energy and they were looking for 400 non-contiguous acres in Glendale. FICTION: The repowered plant will increase air pollution in the area. 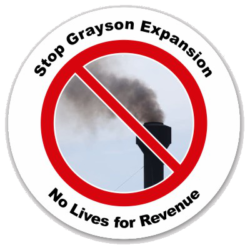 FACT: The permitted emissions from the Grayson Repower project will be less than the permitted emissions from the existing Grayson Power Plant. I think they saved this one for second to last because it’s complete bs. We are saying an air pollution increase and they are saying “permitted emissions” will be less. Maybe they mean that unpermitted emissions will increase? I don’t know. I’m sick of so-called “experts” trying to hide behind fancy terms to justify their shell games. Will there be more smog, carbon monoxide, and asthma-causing particulate matter coming out of the smokestacks at Grayson? An unqualified yes. They can go on about how they are paying for permits to pollute more but at the end of the day there will be more pollution coming out of Grayson. GWP developed emissions estimates for the Grayson Repower to use as a basis for permitting. The permitting process is based in part on the worse case daily emission and peak season monthly emissions coupled with the need to provide sufficient starts and operating hours for possible contingencies. Even with these conservative estimates, the permitted emissions from the repowered plant would be less than the permitted emissions from the existing plant. “The net increase of GHG emissions from the operation of the Project (415,832 metric tons) exceeds the significance threshold of 10,000 metric tons per year.” Yes, they will “offset” this by purchasing credits or redeeming credits or something but at the end of the day it’s more pollution in the air we breathe. Maybe the offsets mean less pollution somewhere else (like maybe the place they want to import clean energy from) but it doesn’t help us here in Glendale. This is what it would look like if you took out the biogas to get a realistic look at the Grayson Baseline. Keep in mind that they want to move all that biogas pollution to Scholl Canyon which means they get to increase the pollution here while having the biogas pollution count as a baseline at Grayson – therefore actually doubling those emissions in our air basin while staying just below the SCAQMD limits for Grayson with this maneuver. 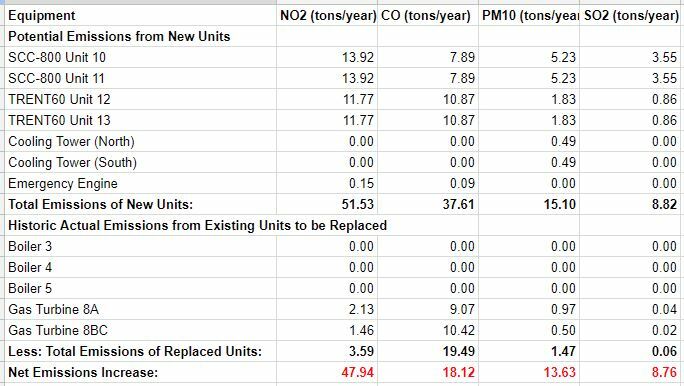 As you can see in the chart below, there is a net increase in all emissions with the new plant. So, in theory, when the biogas has been removed and is polluting Scholl Canyon, the new plant exceeds even those emissions plus some. It already exceeds the threshold of NOx and VOCs. If you take the difference from the no-biogas baseline from the chart above it also exceeds thresholds on CO, PM10, and PM2.5. The permitted emissions from the repowered plant would be greater than recent historic actual emissions from the existing plant due to the reduced operations resulting from the declining availability of the existing units. So, you are admitting that the emissions will increase. 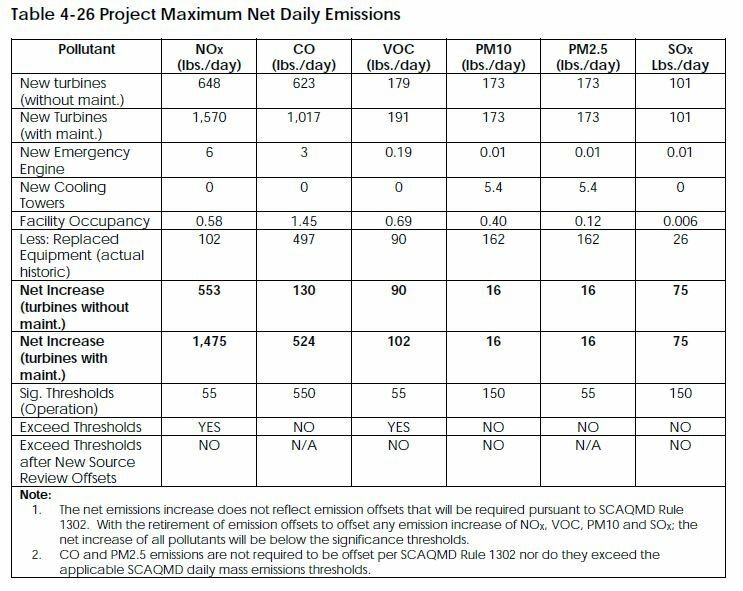 SCAQMD is trying to clean up our air so they look at a licensed power plant’s last 3 years worth of emissions to determine how much emissions they can allow with a rebuild. This is probably why GWP hasn’t already moved the biogas to the new location. They needed to increase their emission profile for the last 3 years. Had they moved the biogas previously then they wouldn’t pass SCAQMD’s criteria. However, the increase in emissions is below the mass emission levels that South Coast Air Quality Management District (AQMD) considers to be significant. As you can see above, without even counting for the biogas pollution switcheroo, the new plant is over the mass emission levels for NOx and VOCs. 1. Actual operations are expected to be less than what is being permitted and assumed for analysis in the Draft Environmental Impact Report, reducing the actual change in anticipated emissions. This is certainly not true if you count the pollution from a new biogas plant and Grayson. 2. Mass emission levels (lb/day) serve only as a coarse indication of the true impacts of a project. For the Grayson Repowering project, we conducted extensive air quality impact analyses and health risk assessments in accordance with methodologies that are recommended and approved by both South Coast AQMD and US Environmental Protection Agency (EPA) based upon both maximum peak season and annual emissions. Those refined analyses demonstrate that the impacts on ambient air quality and public health are below levels of significance. 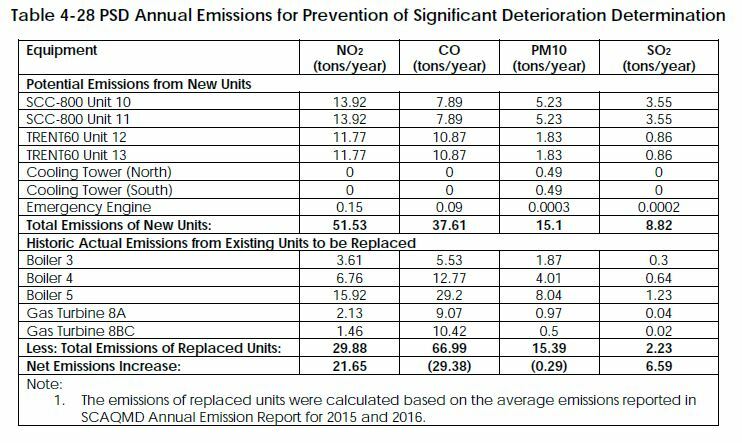 All increases in pollutants such as NOx, VOC, PM10, SOx are further mitigated by offsetting 100 percent of the emission increase, plus another 20 percent, pursuant to South Coast AQMD regulations. Offsetting the emissions does not clean the air. You can offset all you want but the increase in emissions is going to cause new cases of asthma, cancer, and heart disease. It’s very difficult to determine the population density you used in the Cancer Burden but as far as we could determine you didn’t include the worker population of 10 to 15,000 people at Disney and DreamWorks that work right outside of the plant. 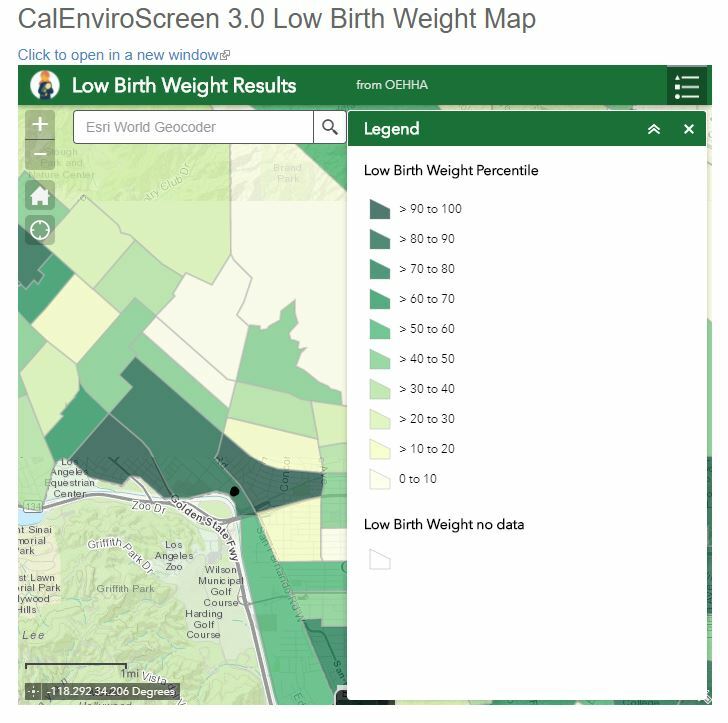 Also, the maximum individual cancer risk (MICR) and Cancer Burden were not calculated to include the biogas pollution at the Scholl Canyon site which may increase the risk. Greenhouse gas emissions (CO2) are assessed on a global basis. Greenhouse gas emissions from the project will be offset through the purchase and surrender of greenhouse gas credits to ensure that the total level of greenhouse gasses continues to decline in accordance with California policy and regulations. You realize that increasing greenhouse gas emissions and then offsetting the increase with purchased or surrendered credits doesn’t reduce GHG emissions, right? That just maintains the current levels. We need to reduce GHG emissions if we want to stop climate change. So, increasing GHG emissions by 400k metric tons is not the right move. You are currently emitting those 415k metric tons. Then you’re going to move that pollution to Scholl and then produce another 415k metric tons at Grayson for a total output of 830,000 metric tons per year! The 415k at Scholl will not require offsets from GWP because it suddenly becomes renewable energy when it’s burned at the landfill. So you are talking about a net increase of 415,000 metric tones of GHG that is not offset. Take some responsibility for the situation the earth is in. Taking advantage of SCAQMD loopholes to produce more greenhouse gasses when the effects of global warming are killing people, creating billions of dollars in damages, and causing the sixth extinction is immoral. Doing this while testifying to be “committed to renewable energy” and saying that Grayson won’t pollute more makes you untrustworthy. It’s worth noting that if Grayson didn’t exist, there is no way that the SCAQMD would permit a power plant in Glendale. The area already fails some federal air standards and they limit new pollution sources. Grayson’s pollution permits are grandfathered in so instead of retiring them which would be the environmentally responsible move, GWP wants to maximize their output by increasing the size of the plant as much as possible. I’m not a fan of offsets because it just seems like a shell game but what would the pollution rights at Grayson be worth if we closed the plant and sold those offsets? FICTION: Demolition of the existing facility and soil remediation will take 9 months; GWP hasn’t ensured contaminants won’t be emitted. FACT: During demolition of the existing facility, waste removal plans will be developed and implemented to ensure that no lead or asbestos or other known contaminants are emitted into the atmosphere. Demolition will be done in accordance with applicable federal, state and local requirements. These requirements address containment and handling of materials, as well as a monitoring plan to ensure compliance. These requirements are not specific to the demolition of a power plant; they apply to all demolition work. The contractors we will use are licensed to do this type of demolition and meet these requirements. Will Mr. Zurn provide a personal guarantee against his $300k/yr salary that no contaminants will be released into the local community? If not, we don’t want to hear weak promises. In fact, GWP does not know what it will find below the plant and how long it will take or what it will cost to clean it up. Plus the plant waste is slated to go into Scholl Canyon so we aren’t really getting rid of it are we? 9 months of construction. That makes me think of babies. Did you know that the areas around Grayson have some of the lowest birth weight babies? The CDC says that one cause of low birth weight is “Exposure to air pollution”. The area around Grayson has some of the lowest birthrates. Well, this is awkward. You weren’t going to bring this up were you? 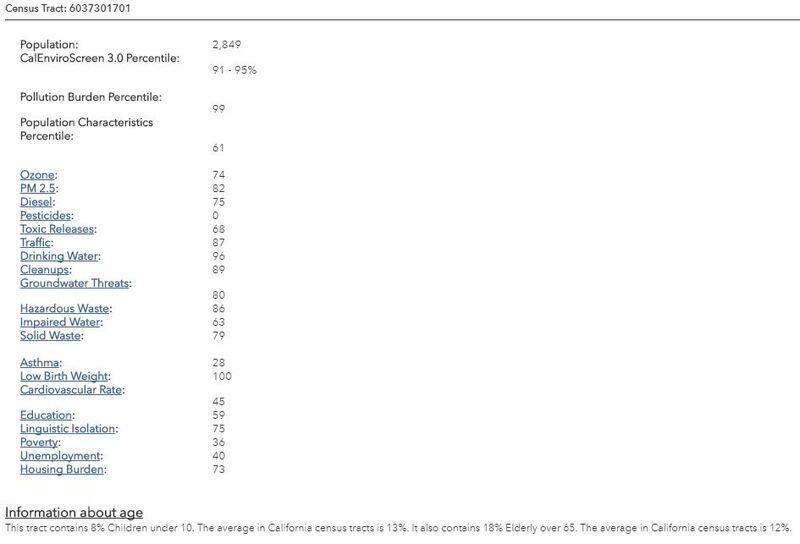 The area around Grayson is considered by CalEPA to be an SB 535 Disadvantaged Community based upon a number of factors. Here are the maps and the criteria for designation. This means that the population around Grayson is the most vulnerable to pollution and are disproportionately burdened by multiple sources of pollution. The proposed plant will make the pollution worse on a population that is already struggling with the impacts of pollution. 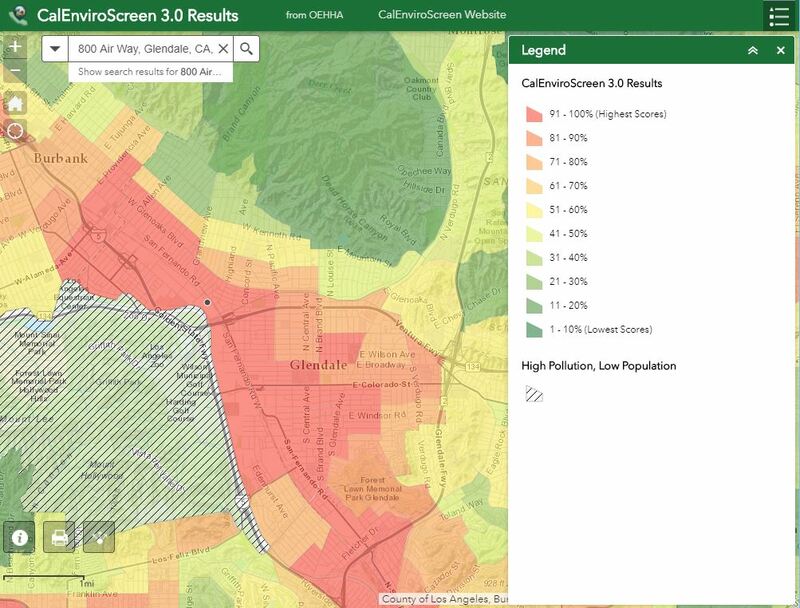 Also, look closely, a large part of Glendale is in the worst of the worst for being disproportionately burdened by multiple sources of pollution. This is a once in a lifetime chance to clean up the air in Glendale. Don’t let it pass us by! Criteria for Disadvantaged Community Designation – scores out of 100 with 100 being the worst.